Launched in 2015 by independent British publisher Candy Jar Books, this is a range of novels featuring Colonel Alistair Lethbridge-Stewart, the character better known of course as the Brigadier. The stories are mainly set after The Web of Fear when he first met the Doctor, but before his promotion to Brigadier and his appearance as a regular character in Doctor Who. This page lists full length novels only. 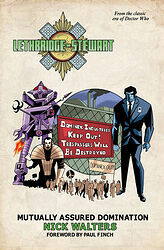 Candy Jar have also released a number of Lethbridge-Stewart short story collections which are listed separately. In 2016, Fantom Films also released audio readings of the first four novels.